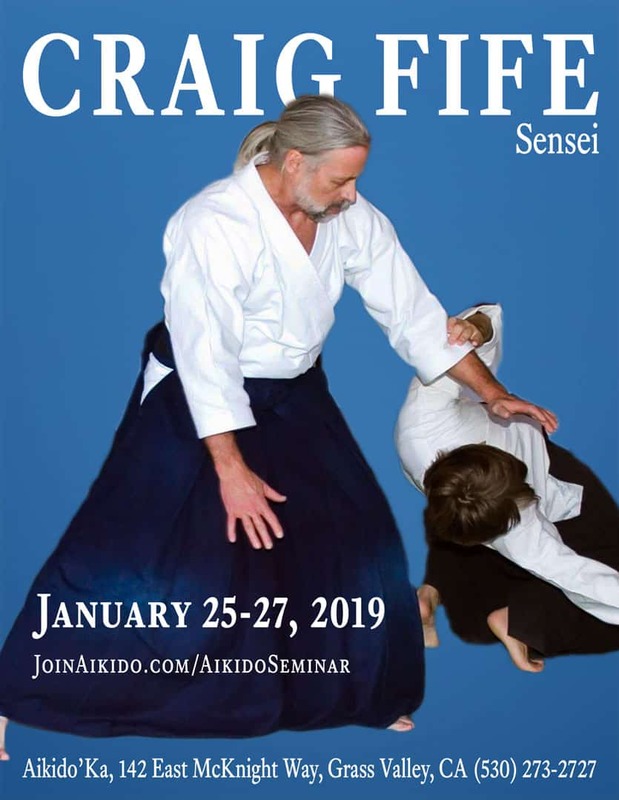 Please join us for Craig Fife Sensei’s Seminar, January 25-27, 2019. The seminar is at Aikido’Ka, 142 East McKnight Way, Grass Valley, CA. 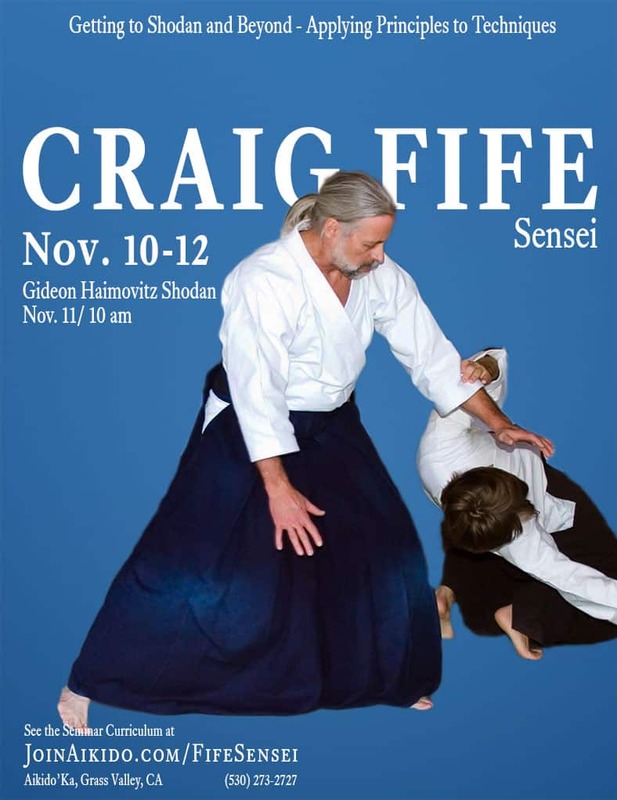 Please join us for Craig Fife Sensei. You are in for a treat. Fife Sensei is an extraordinary aikido instructor and an absolutely first-rate person. He is, without question, one of my favorite people to train with. I simply do not miss an opportunity to train with him, if I can possibly help it. You will enjoy yourself and learn a tremendous amount at this seminar. Craig Fife Sensei is the founder and chief instructor of Aikido Northwest. Since 2013, Fife Sensei has been one of the headliners of Aiki Summer Retreat, with Michael Friedl Shihan and Kimberly Richardson Sensei. He began his aikido training in 1973 in Boise, Idaho. Fife Sensei currently holds the rank of Rokudan (6th degree black belt), from the Aikikai Foundation, Aikido World Headquarters, Tokyo, Japan. This rank was awarded to him by his teacher, Frank Doran Shihan. In addition to Fife Sensei’s personal study of Aikido, he has been actively teaching Aikido since 1980. Fife Sensei has also been a student of Iaido since 1990 and currently holds the rank of Nidan (2nd degree black belt) from the All United States Kendo Federation. Fife Sensei is President of the California Aikido Association. For more information and to register for the seminar, go to the Craig Fife Sensei Seminar page. You will also find there links to two really fun and interesting podcasts I did with Fife Sensei. Michele Simone Sensei and Frank Bloksberg Sensei training together. Michele Simone Sensei and I just recorded a conversation about her upcoming self defense and street effective aikido seminar. 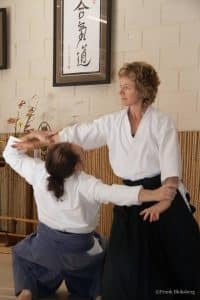 Michele Sensei speaks about her self defense training, what we’ll be doing at the seminar and some basic self defense tips. I had a really good time speaking with Michele Sensei and I hope you have a good time listening to our conversation. To learn more about, and register for, Michele Sensei's self defense and street effective aikido seminar click here. Gideon Haimovitz’s shodan test (first degree black belt) will be Saturday, November 11, 2017, around 10 am, Gideon Haimovitz will be doing his shodan exam. The exam is during Craig Fife Sensei’s seminar, November 10 – 12, 2017. Gideon is a long-time student of Aikido’Ka, going on 8 years. Everyone who knows Gideon thinks the world of him and he’s immense fun to train with. He’s been preparing very diligently and his exam will be amazing. We’ve rescheduled Craig Fife Sensei’s seminar to November 10 – 12, 2017. 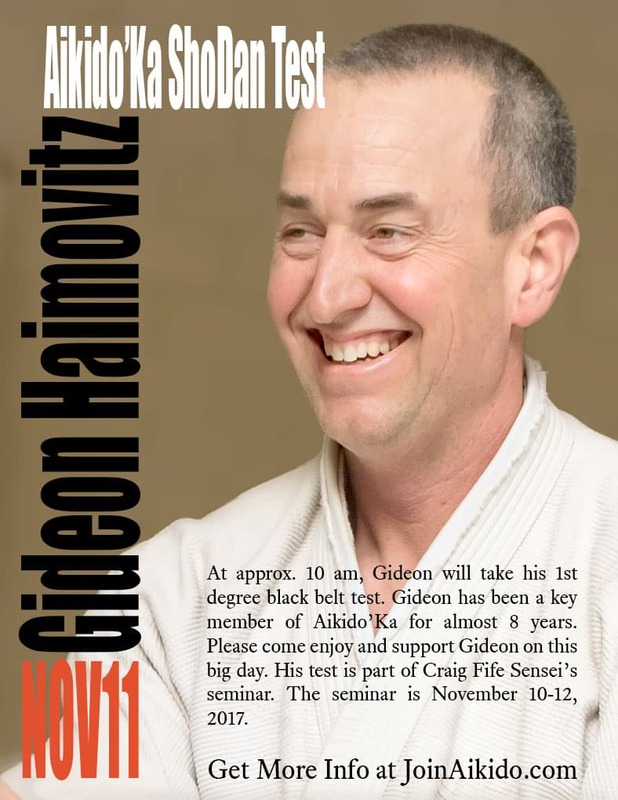 Our good friend Gideon Haimovitz will do his shodan test on Saturday morning, November 11, at about 10 am. Many folks will know Craig Sensei from being one of the Aiki Summer Retreat headliners. He’s an extraordinary aikido instructor and an absolutely first-rate person. You will enjoy yourself and learn a tremendous amount at this seminar. Please join us! In addition to Fife Sensei’s personal study of Aikido, he has been actively teaching Aikido since 1980. Fife Sensei has also been a student of Iaido since 1990 and currently holds the rank of Nidan (2nd degree black belt) from the All United States Kendo Federation. Fife Sensei is a member of the California Aikido Association Teaching Committee. For more info and to register for the seminar, click here. Aiki Summer Retreat 2017 – Registration is Open! 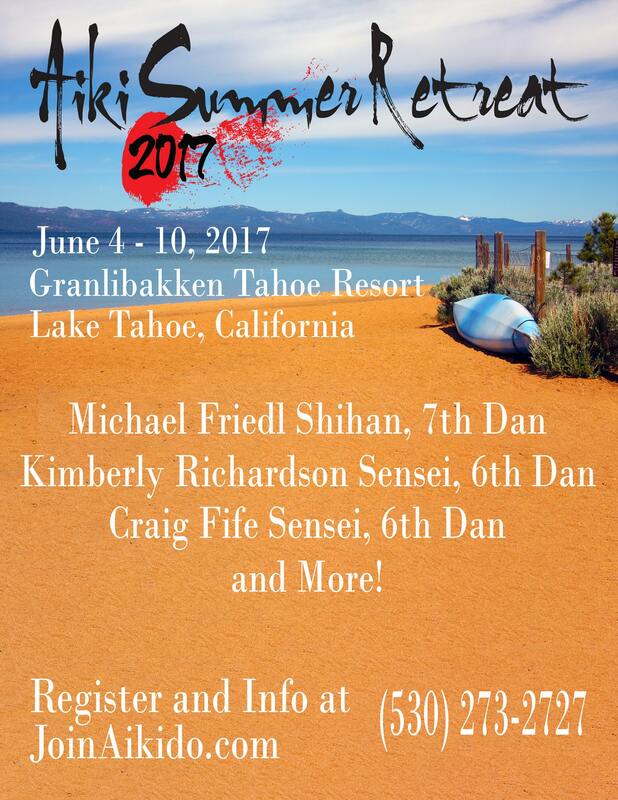 Join us for Aiki Summer Retreat 2017, June 4 – 10 at beautiful Granlibakken Tahoe. Our headline instructors are Michael Friedl Shihan, Kimberly Richardson Sensei, and Craig Fife Sensei. Get all of the information about the Retreat and registration at the Aiki Summer Retreat home page. Here’s a link to a PDF of the Retreat flyer. Don’t delay! The Early Bird Special ends on April 30 and registration closes on May 21.